Introducing the new version of the Rainbow II Color Reader, a talking color identifier for the visually impaired and color blind. 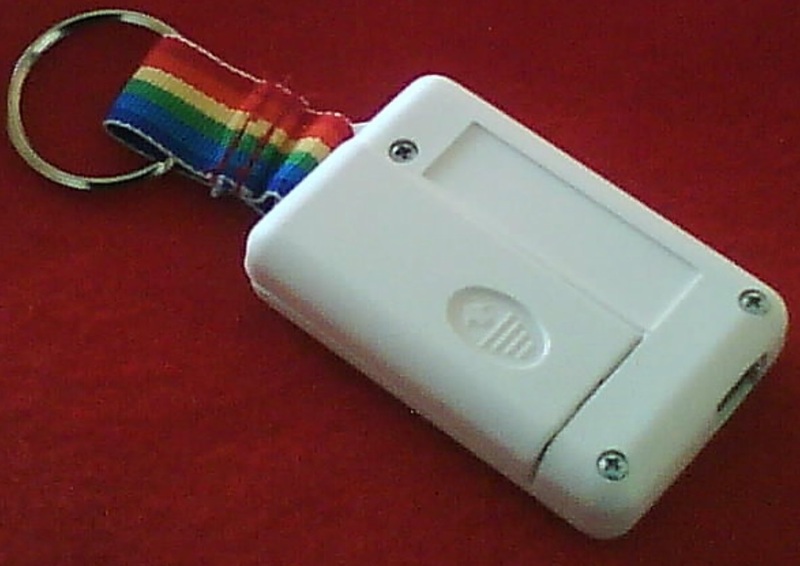 Small, accurate and easy to use, the Rainbow Color Reader can easily fit in a pocket. With over 40 colors, it provides accurate color discrimination without confusing the user with odd color names or vague descriptions of the color. Only one button and only a single AAA battery (included) means simple operation and maintenance! Who needs the Rainbow II? The Rainbow II was originally designed for the President of the company, who is visually impaired. She enjoyed wearing bright colors, but wanted to be sure she was wearing the correct ones! The Rainbow II's simple, quick operation provides the color quickly and easily, making it easy to get dressed in the correct color, sort clothes, pick the right color yarn or ribbon, and any other task that requires color. The Color-Blind or, more precisely the WIVES of the Color-Blind! Men with the various types of color blindness find the Rainbow II very useful in picking out the correct color shirt, t-shirt, tie, pants or any other easily confused color object. The ability to read bright LEDs means indicators can now be read correctly. It is easy to hang in a closet or keep in a pocket for when it is needed! Children love the Rainbow II Color Reader! Give them one, and they will spend the next hour reading the colors of everything in the house. To make learning colors even more fun, we have "Snowy's Colorful Rainbow Adventure" a booklet with a small story to see and read, touch colorful felt shapes and hear the colors spoken by the Rainbow II Color Reader. For more information, please click here. Now Available with payments through PayPal or through Amazon.com! Introductory Pricing for the Rainbow II Color Reader is just $70 each! Sorry, but we only ship to North America through this link. For other purchasing options, please click here! Firmly place an article flat against the small plastic window on the right side of the front of the Rainbow Color Reader, then press the red arrowhead button below the window on the top. The Rainbow Color Reader will then read the color of the material. Reads lights and bright LEDs! If you hold the window up to a bright LED or other light, it will indicate the color of the light. If you hold down the button for three seconds after it reads a color, it will say a number indicating the next volume level. If you find a color that does not read correctly, please contact Edmondson Engineering at (760) 329-0282. We are always seeking to improve the Rainbow II and welcome all questions and comments. To change the AAA battery, just slide the battery cover back towards the ribbon and key ring. The battery goes in with the button end (positive) of the battery towards the ribbon. THE NEW RAINBOW II COLOR READER HAS A FOUR MONTH WARRANTY. 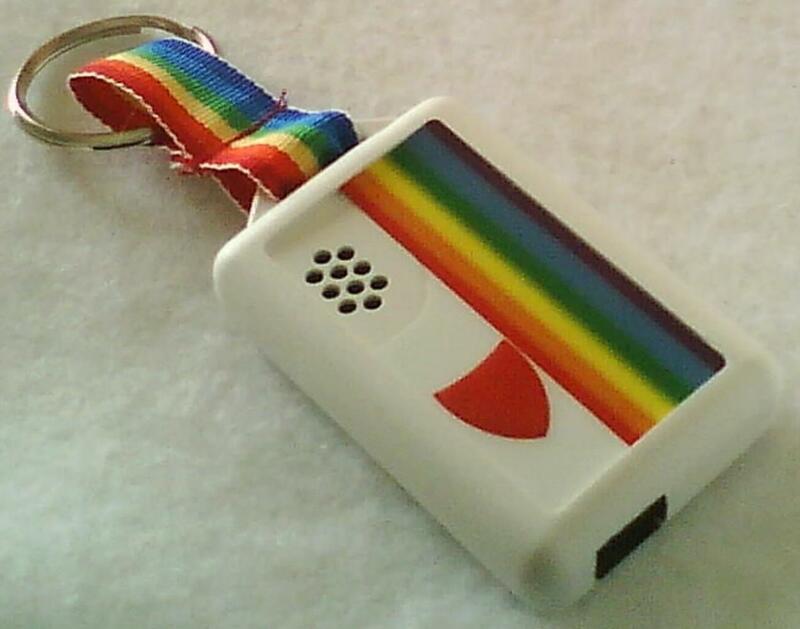 It will be replaced with a new rainbow color reader at any time during the four months, and all postage will be paid. Up to a year after purchase the unit may be sent back and repaired with all postage paid by the user. DISCLAIMER: The Rainbow II Color Reader is intended as a tool to assist in the determination of the color of common household objects, such as clothing. It is not a precision colorimeter, and may not be accurate in all circumstances or on all materials.